The Detail: Co-showrunners Ley Lukins and Adam Pettle on producing the first season and breaking free from Scott & Bailey | TV, eh? Showrunning a TV series is a huge job. In fact, it’s so big that it sometimes requires the help of a friend to pull it off. 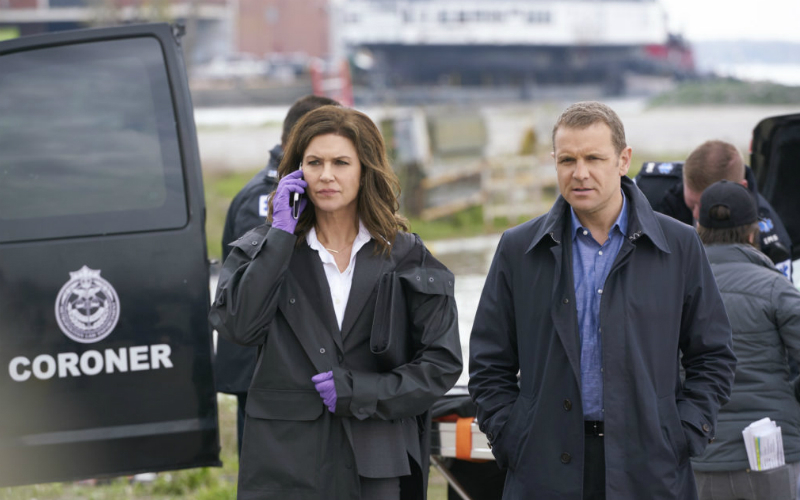 That was the case for Ley Lukins and Adam Pettle, who acted as co-showrunners during the first season of CTV’s new detective series, The Detail. Luckily, that’s just the kind of working relationship Lukins and Pettle have. The pair first hit it off several years ago in the Rookie Blue writers’ room. Then, when Pettle was showrunning Saving Hope, he made sure to hire Lukins because “she’s one of the most phenomenal writers I’ve ever worked with.” So when CTV gave Lukins the green light to put The Detail—an adaptation of Sally Wainwright’s U.K. hit, Scott & Bailey starring Suranne Jones and Lesley Sharp—into production, it seemed natural to have her co-run the series with Pettle. 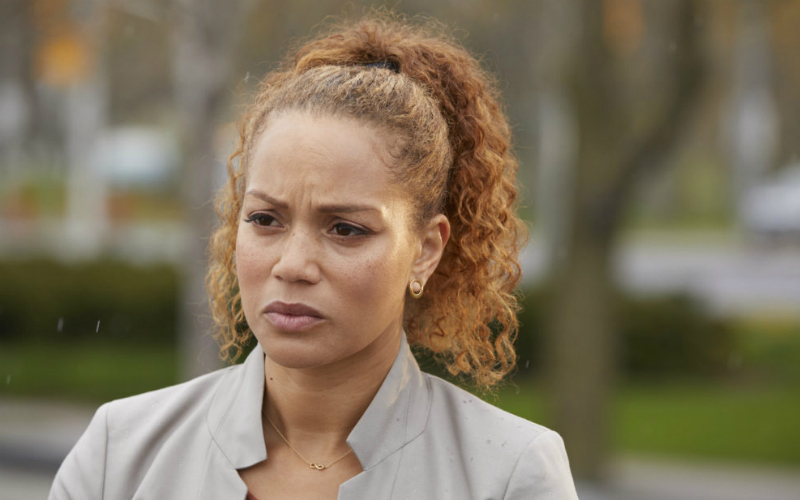 The Detail, which focuses on the professional and personal lives of three female homicide detectives, is approaching mid-season and picking up steam. 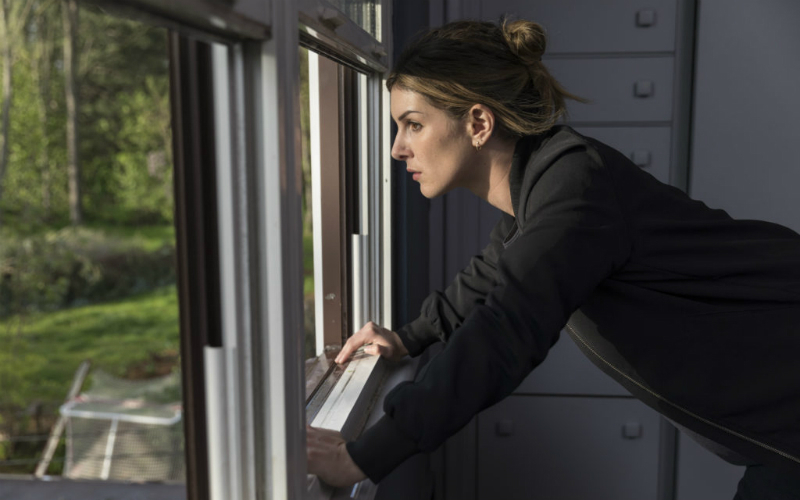 Last week, Jack (Shenae Grimes-Beech) confided in Stevie (Angela Griffin) that she’s pregnant with ex-boyfriend Marc’s (Ben Bass) baby, while Stevie and Kyle (David Cubitt) dug into an old, unsolved case. Meanwhile, Fiona (Wendy Crewson) bet on Jack’s interrogation skills to keep a serial killer behind bars and her professional reputation intact. 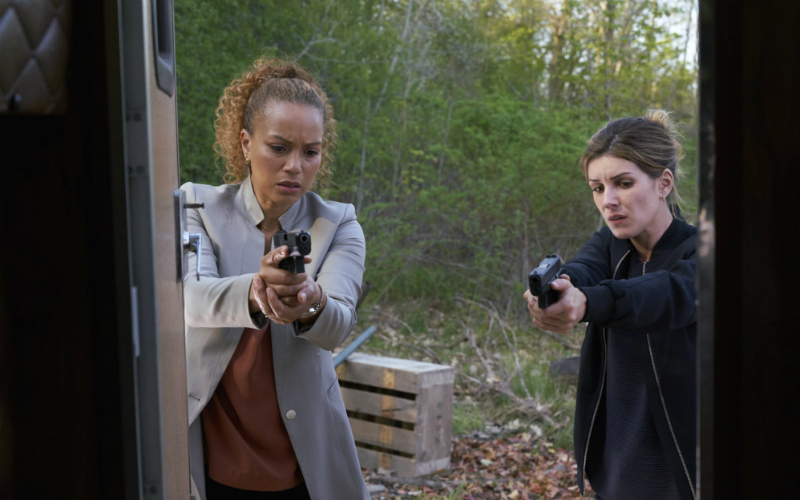 Ahead of Sunday’s new episode, “Secret Liars,” Lukins and Pettle joined us by phone to discuss the development process for the series, how they worked to distinguish it from Scott & Bailey, and what’s coming up next for the show’s characters. Ley, you worked for around two years developing The Detail. How did you first become involved with the show? Ley Lukins: Ilana Frank, one of the executive producers on the project, optioned the rights for the British format, Scott & Bailey. She had been developing it herself previously, so she sort of came to me and needed to secure a writer on it and asked if I would be interested in developing it with her. And I said I absolutely would. I watched the British series and thought it was fantastic, and then we sort of went from there. Adam was brought in as a co-showrunner after the series was ordered. Did that lead to any changes in the show’s direction? LL: We sort of talked through and mapped out where we thought Season 1 could go. Initially, there were two episodes written, and the pilot remained the pilot, and the other episode we moved down the line and instead did an original for Episode 2 to kind of start planting that we were going to be diverging from the original adaptation. Adam Pettle: Because I have showrunning experience and it was Ley’s show, I feel like I kind of brought different things to the party. I never wanted to take ownership or control and make it into my voice or my thing because Ley had worked for two years in development on it, and it was so obviously her thing. And the whole idea was for me to do a year and then for Ley to run the show on her own. So Ley would be the sole showrunner for a hypothetical Season 2? AP: That would be the arrangement, yes. But hopefully, I’ll write on it. Ley, what was the biggest showrunning lesson you learned during Season 1 that you would bring forward into Season 2? Honestly, the most valuable thing I learned was that it all comes down to trust. Despite how many balls there are in the air at any given time, everything will get done at the end of the day. You need to trust yourself, trust the team, and most importantly, trust the process. Is the development process different when a series is an adaptation, as opposed to an original concept? LL: It’s different in the sense that you already have a sort of roadmap of what the series is and what it looks like. And it’s unique in the sense that, a lot of the time, people will adapt things that are in different languages, and this was already in English, so that was a bit of a challenge. Instead of just taking it from a foreign language and putting it into English, it was sort of more gearing it toward a North American audience. And, obviously, it comes with the characters. Scott & Bailey have five seasons or five series as they say in Britain, so it basically came down to kind of preserving all the things that everyone loved about the series—because the original series is so phenomenal—then slowly sort of diverting from that and making it into its own thing. The pilot is very similar to the pilot in the original, and then slowly we moved the series in a different direction. We changed up elements of the characters. We added more diversity to the show because that was something that we wanted to do. And we also changed the serialized case. We have lots of original episodes as well. AP: There are definitely challenges. I think the first one is that we all loved the original show, so there’s, not an intimidation factor, but you don’t want to f**k it up, and you don’t want to write something that everyone thinks is god-awful. And, on the other hand, we wanted to make it our own thing and wanted to make a new original show for Bell [Media]. So we had this great magnum, this great raw material in the original scripts. We were told we could use as much or as little of it as we wanted to, which is amazing. But I think the process is separating yourself from the original material enough so you can create your own thing. And that takes some time. Let’s talk a bit about the casting. What was it about Shenae Grimes-Beech, Angela Griffin, and Wendy Crewson that made you say, ‘They’re the ones’? AP: Well, Shenae just is [Jack]. Shenae is a badass. Shenae is super smart. She has an edge but also an amazing sense of humour, and she’s so quick on her feet and also, I think, has lived. I think there’s a lot of actors who would shy away from someone being hungover, someone sleeping in their car for an episode, and Shenae just gets it and loves going there. She’s just an amazing fit, I think she’s brilliant. And Angela is just a powerhouse actor. The audition search, the net was cast far and wide, and obviously, it’s a big show for Bell, and they didn’t want to leave any stone unturned. I remember seeing Angela’s audition tape from the U.K., and she lights up onscreen. LL: Ilana Frank is amazingly skilled at casting. She has sort of a preternatural ability for it. And I think the minute Shenae’s tape came in, she knew she wanted Shenae. We were all very excited about Shenae’s audition and felt that she just had something about her that felt very true to who Jack’s character is. And Wendy was someone who we kind of always had in mind, even in the development process for Fiona. Because she worked with us on Saving Hope and she’s such a force of nature and she’s such a wonderful, amazing actress. It just didn’t seem that anyone else could do that part. And Angela, there was just this unbelievable competence and warmth about her audition. Stevie is a character that kind of has to be very hard and very soft at the same time. She’s a bit of an iron fist in a velvet glove, and it can very hard to find that balance in people, and Angela had that perfect sort of balance of those two things that really spoke to us when we saw her audition. The Detail is focused on Jack and Stevie’s relationship, but Fiona is almost a third lead character. Did that present any challenges in the writers’ room? AP: It’s a balance. The relationship between Jack and Stevie, that potential loss of their relationship and friendship and love affair is kind of what created the spine of the show, so all the stories kind of branched off of that. And then Fiona, Wendy is such an amazing actor who could be the lead of any series, so it was just a matter of fitting that third part of the triangle into the stories. But because she’s their boss, and they’re not all really on the same tier, there’s a power dynamic inherent in their relationship, she fits into the story. As far as the personal stuff goes, that was more challenging to know what we were going to reveal. In [Scott & Bailey], Jill—who’s our Fiona character—really in Series 2 and 3, we learn way more about her. But Wendy Crewson really felt that she didn’t want too much personal stuff about Fiona early on because she feels that she wouldn’t reveal it. And being the boss, you’re going to have to play your cards a little closer to your chest. So, the personal stuff was more of a challenge. But it’s always that balancing act in any room. I love the fact that it’s three women that we were talking about because so often on cop shows it’s skewed the other way. It was such a refreshing dialogue in the writers’ room. Some of the criminal cases reflect what’s going on in the characters’ personal lives. How did this impact the way you chose cases for the show? LL: Some cases very fully reflect things that are going on in the characters’ lives. We did try to sprinkle in some cases that maybe weren’t as deeply linked, just so it didn’t become too redundant or too predictable. And we didn’t want it to ever dictate a case too much, in the sense that we were only telling this case to get this character point across. Because wanting to match those two things every time, it can feel inauthentic. Our writers in the writers’ room also came in with personal experiences or cases that they wanted to investigate because they either had first-hand knowledge or it was research that they had encountered that they felt they could tell a really great story. And so there were times that the mystery of the case trumped character. It was sort of a mixture of the two. When we spoke to Shenae Grimes-Beech and Angela Griffin, they told us that they loved how much Jack and Stevie supported each other. Was that a theme you were purposely trying to drive home? LL: Yes, I think that was something both Adam and I were adamant about right out of the gate. We said the primary love story of this show is between these women, and it’s their relationship. It’s not dissimilar to the original, and we wanted to make sure that we preserved that element of it, and when people tuned in, they were going to see women supportive of each other’s successes, who advocated for each other and who always had each other’s backs. Because that’s the way women are. Can you give us any hints about what to expect in the next few episodes? AP: The baby being Marc’s comes back into play. And then Stevie and Jono’s relationship is to be tested with the reemergence of Kyle Price. LL: There’s a very exciting court episode coming up, which I think is a very important episode, and I think it deals with a very important issue that’s in the news a lot. We will get the answers to some of the questions that have been planted earlier in the season. It’s getting good! And do you already have storylines in mind for Season 2? LL: We have lots of ideas for Season 2. I think we left Season 1 off in a really good place that gives lots of opportunities for stories in Season 2. So I’m excited. AP: There’s definitely a Season 2 that’s well-formed already. So hopefully, we get the chance. The Detail airs Sundays at 9 p.m. ET on CTV. Fantastic piece – thanks Amy!! If only it was as interesting as Scott & Bailey. The show not only appropriated the plotline from a British TV cop show, they also appropriated the title “The Detail” from a Russian police drama, which is available on Netflix and which is infinitely better. This show is dreadful, even by Canadian standards.